Cox and NicNat are RUCs only in 2014. Are you considering either of them? See if you can find some value from the boys out west. Both Dean Cox and Nic Naitanui have lost their RUC/FWD status and are just named up as straight RUCs. New recruit Xavier Ellis ($135,500) will potentially be a very popular selection if he’s in for Round 1. Despite the premium put on him, Dom Sheed ($235,800) still might be an option as he is a good chance to get opportunity at the start of the season. 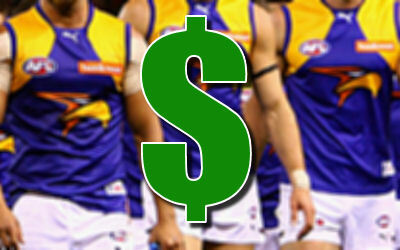 I have notice that the West Coast Eagles don’t have any DPP’s players. Any suggestions why? They all played one-dimensional roles in 2013. Xavier Ellis could be a good cash cow! My thinking exactly with Xavier Ellis. As soon as he breaks down after 3 games kick him out. I was kind of excited to have my first Eagle rook since Gaff/Darling this year, but with rookies getting the extra premium this season, might have to overlook Dom Sheed for the moment. Xavier Ellis is cheap…. But nowhere near a lock in the Best 22, even when fit. I think either way he’ll have to win his spot over the NAB Cup, and likely for East Perth early in 2014. No DPPs? That’s because Eagles were one dimensional last year. I’d love to see guys like Yeo (def/mid), LeCras (mid/Fwd), Cox (ruck/fwd), NicNat (ruck/fwd) evolve into DPPs through flexible roles this year, and Adam Simpson has already said he’s big on creating multi-faceted players. Overall, not too many Eagles will come into calculations for my starting squad. My boy Scooter is a chance, because I know he hasn’t topped out yet – but with so many under-priced Mids, he may get overlooked. Even a cheap NicNat in the ruck is tempting, but with Sandi and other ruckmen also discounted, it could be a case of picking the best value guys. Gaff’s the breakout contender, and one guys right alongside Greene for mid-price contention in my side. Unfortunately, I think he’ll continue to get tagged with Kerr now retiring, and that lowers his ceiling greatly. Waters, Masten and Tunbridge make the watch-list, but that’s about it for me. Tbettas spot on about WCE being 1 dimensional, they need more depth guys rotating through half forward and being part of their midfield rotations as they just don’t seem to have any apart from Lecras at times. Anyways Masten copped an injury effected 16 I think late in the season which dented his average, he’d be more so a Rockliff type price if he didn’t get injured then. Defo a decent unique type if he stays fit.